ðŸ”” School is back in session! And with the new year comes new kids who are excited and ready to learn. We are lucky to have our very own "New Kids in Class", Ann Kozma & Jess Boyce, joining the Educator Innovation Team along with me, Jornea Erwin. I'm so excited to embark on a journey with two phenomenal educators as we join forces to support you all as you amplify voice around the world! ðŸ‘‹Hey everybody! Itâ€™s nice to meet you! Iâ€™m new around hereâ€¦ my name is Ann Kozma. Iâ€™m joining Educator Innovation Team @Flipgrid as one of the new Teacher Innovation Leads. I am super excited to connect with you and work together to empower our scholars and amplify #studentvoice. Everyone is curious about the new kid in class, right? Let me share a little bit about myself. I started teaching in 2004 and spent 10 years in the classroom. In 2010, my school went one to one with the first generation of iPod Touch. Teaching and learning was transformed in my classroom as I began to leverage technology to empower my scholars to share and showcase their learning in new ways! I loved helping my 1st graders show what they know and share their authentic voices with others. In 2014, I transitioned out of the classroom as a Teacher on Special Assignment and have spent the past 4 years helping other teachers with the innovative and instructional use of technology. I am a member of the Apple Distinguished Educator Class of 2015, Leading Edge Certified as a Professional Learning Leader, and a CUE Lead Learner. I love playing to learn and believe that we are always #bettertogether. Explore. Share. Contribute. These three words are what I strive to do as an educator. I am so excited to work with you all to empower scholars and amplify student voice. California is home for me and when Iâ€™m not on the go, you can usually find me slow strolling Huntington Beach looking for shells or laying in my hammock with a good book. I love to travel, take pictures and go to the movies. Iâ€™m sort of obsessed with pomegranates and I absolutely love peach iced tea. Iâ€™m excited to meet all of you...letâ€™s get connected! Find me on social @annkozma723. ðŸ‘‹Hey everyone, Iâ€™m Jess, a former middle school math teacher from St. Petersburg, Florida who just joined the Educator Innovation Team at Flipgrid! I grew up in Pittsburgh, PA (Go Steelers!) and moved to St. Petersburg, Florida 5 years ago because I was cold and needed some sunshine in my life. I was a middle school math teacher for 10 years and have a passion for growing and learning. When I stumbled upon the edtech world a few years ago, I knew that I could never go back. My practices changed, I became a better teacher, I yearned for more and more ways to grow and get better. I became obsessed with attending as many conferences, Edcamps, etc. as possible so that I could improve my practice. Find me on social @jessxbo. I became an MIEExpert in the summer of 2017, after years of using every possible Microsoft tool in my classroom. This was around the time I also became a Student Voice Ambassador for Flipgrid â€“ I found two passions that I simply could not stay quiet about. When I wasnâ€™t teaching, I was training or just running into classrooms cheering about new things I was discovering and fun ways to implement them. These two merging was more than I could ever ask for! 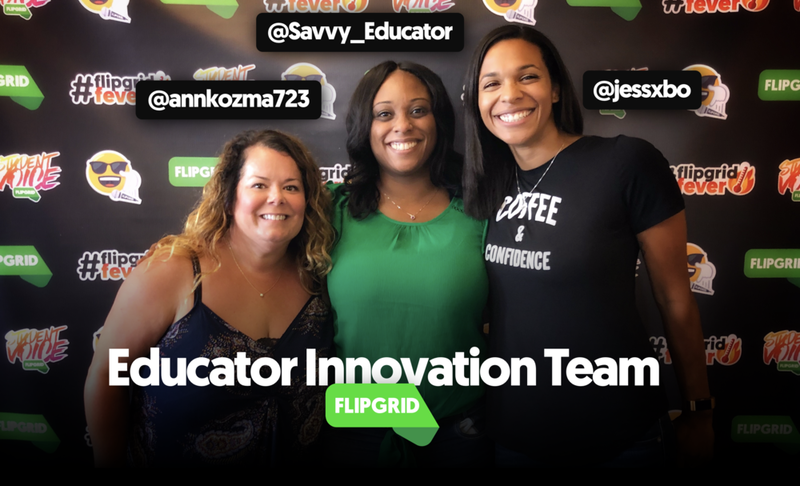 I could not be more honored to be a part of the Educator Innovation Team â€“ Flipgrid is a company that truly aligns with my heart. It has always been about championing educators and students and I feel so fortunate to get to do that! I cannot wait to meet you all and grow together as we amplify student voice!